...until the Pyrenees that is. In these parts, the tour is going well. 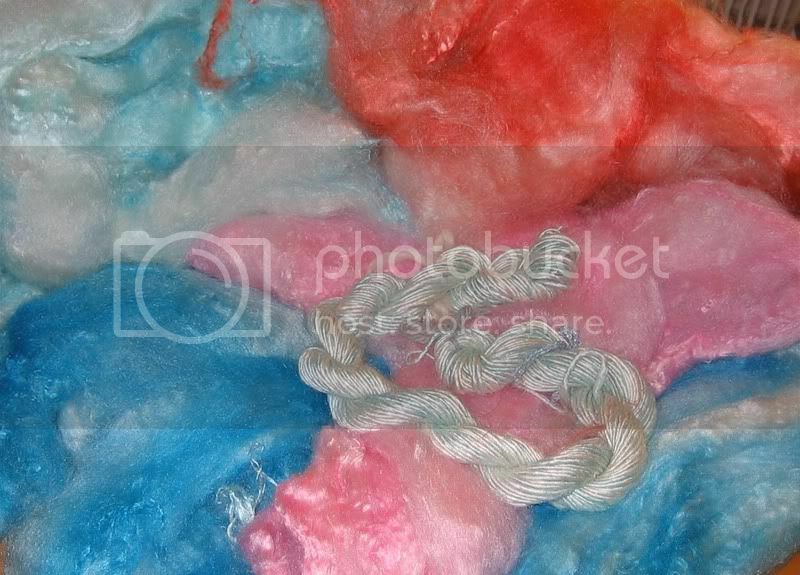 I played with silk on the rest day yesterday - great summertime fiber. The shine that was happening while I was spinning was hypnotic! I've also plied the yarn you see on the bobbins there and am happy with the result, though it is bulkier than I would have liked. I think for my birthday this year I'm asking for a high-speed flyer. I love my vintage Louet but it's tough to spin thin on it. Anyway, I'm going to call it rosebleed since it's pretty but in a bruisy way. Just like the guys in the peloton. Like le Tour cyclists, the Tour de Fleece spinners are a tough group. I imagine we are, anyhow. To give you an appreciation on their dedication, I'm telling you now that there are some riders who have serious injuries and they have not quit. Andreas Kloden has a broken tailbone. And he is still riding. His bike. Think about it. Vinokourov crashed on an earlier stage and has stitches all over his body, including both knees which were done while his leg was bent so he can still ride. He can't, however, stand up straight. I won't even mention the metal plate Contador has in his head. These tales are meant to inspire. I know there are other things to do besides spinning, but the Tour only happens once a year. It's time to dig deep and soldier on. We can do it! i ended up missing sunday, so i spun on rest day. i even posted pics yesterday on flickr! did you hear about the german rider who ran into a stray dog? apparently t hey're both ok, but it was a spectacular crash. Tour de Fleece - I love it! My felted beads came out fabulously. It was stressful at first because I was really worried about having bumpy, uneven beads, but I got it rights after a bit of practice. Pruny hands are a downer though. 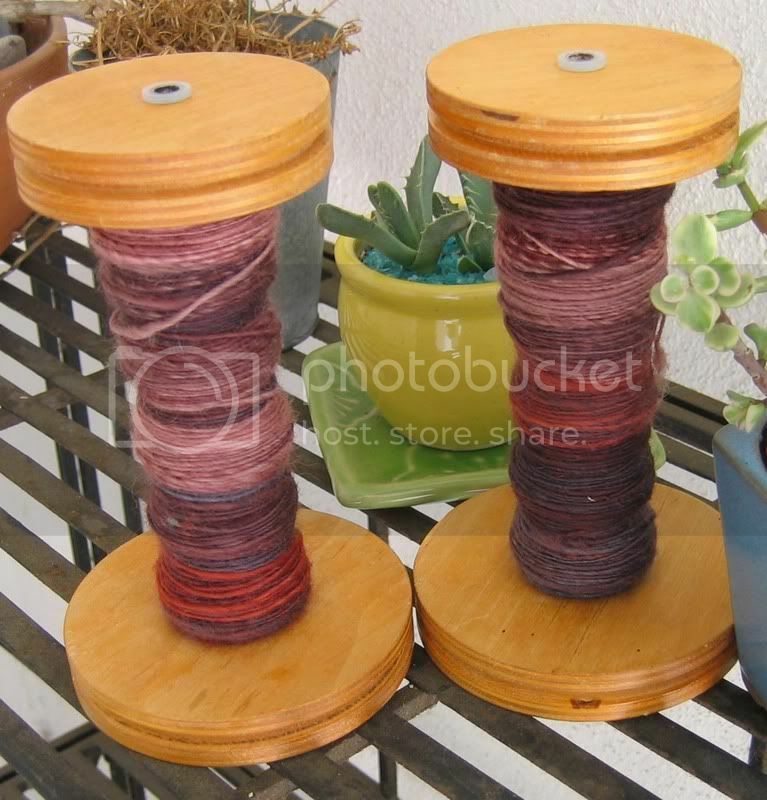 I'm trying to get into spinning now - it looks likes fun! quick question - i want to add the little knitting ring picture link to my blog, but I don't know how to do it with blogger. i can get the picture in, but it doesn't take me anywhere. do you know how to do this? thanks!